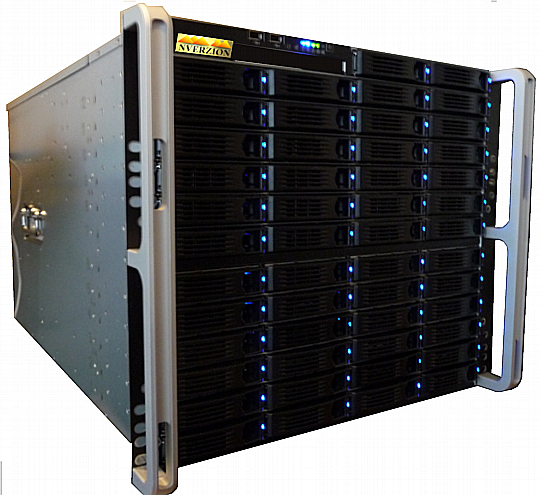 NVerizon's TeraStore nearline storage archive systems present an affordable, compact, scalable rack-mountable storage option that's ideal for the growing content storage needs of broadcasters today. With 3RU (16 drives) and 4RU (24 drives) configurations available, NVerzion has a disk-based storage option that's perfect for any environment. And, it's modular construction means there's no limit to the number of units that can be combined to offer the storage you require. The network-based, RAID-protected storage systems offer maximum flexibility at an affordable price — and they're fully extensible by adding TeraStore boxes to any existing gigabit network. NVerzion's XPansion storage management software suite is the perfect complement to the TeraStore system, providing a fully integrated control platform to quickly retrieve and manage media between all of your network-connected devices. TeraStore's hard drive media is enclosed in a rugged case, keeping out dust, fingerprints, and scratches. SATA drives last for years and data is easily reproducible and redistributed at a rate limited only by the network. As technology advances, and storage capacity increases, the format of the data and the control of the devices remains consistent with the TeraStore system, unlike with other storage devices. Upgrade your system without worry — the technology is always compatible with the existing control system. The NAS technology provides for easy expansion by simply adding additional TeraStore boxes.